candidacy this year? He brings moderation and an actual record of bipartisanship to a party and a primary electorate that seems interested in neither. ….The obvious answer, of course, is that he’s leaping in because he thinks he can win. Actually, I’d say the obvious answer is exactly the opposite. 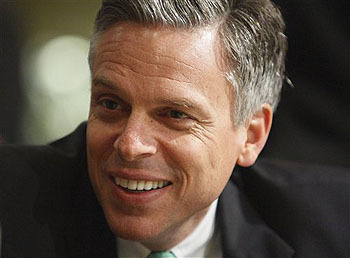 Huntsman’s chances do indeed seem pretty slim in this election cycle — both in the primaries and in the general election. However, his name recognition is minuscule, and if he wants to run seriously in 2016 he needs to become better known. The best way to do that is to run in 2012. If he runs a decent, serious race, but loses to a more wingnutty candidate who then gets blown out by Obama, he’ll have pretty good credentials for a 2016 run. Now, I don’t know if actual big-time politicians ever think this way. They seem to have an almost bottomless ability to believe against all evidence that they can win the presidency. (Fred Thompson? Seriously?) But Huntsman seems like a pretty smart, self-aware guy, and I wouldn’t be surprised if he knows perfectly well that the odds are stacked against him. Most likely, what he’s really doing is auditioning for 2016.